tarts & crafts: where's winter? We haven't had much of a winter around here. I think it has snowed a total of 2 times since October. I keep hoping we'll get a real, snowy winter. Fingers crossed. 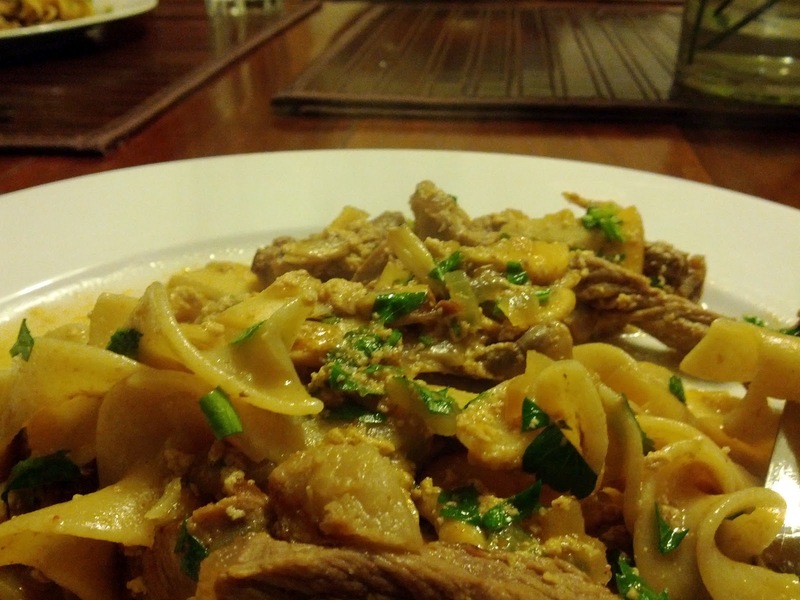 Maybe that's why I made us some warm comforting food to tuck into: I made beef stroganoff for dinner tonight. I bought some very pretty button mushrooms from the store and some grilling steak. All in all, this was a quick and easy recipe. And hubby really liked it (he went for seconds!). 1) definitely fry your steak in two batches. I did mine all at once and the steak gave off alot of liquid. Not what you want. 2) I used yoghurt instead of sour cream. I think this gave off more liquid, and we also lost the creamy tanginess of the sour cream. Next time, I'm sticking with sour cream. Cut the steak into slices 1cm/0.5in thick, then cut each slice across the grain into strips 1cm/0.5in wide. Melt the butter in a large frying pan, add the paprika and onion and cook slowly until the onion is soft and sweet, but not browned. Cook noodles in boiling water. 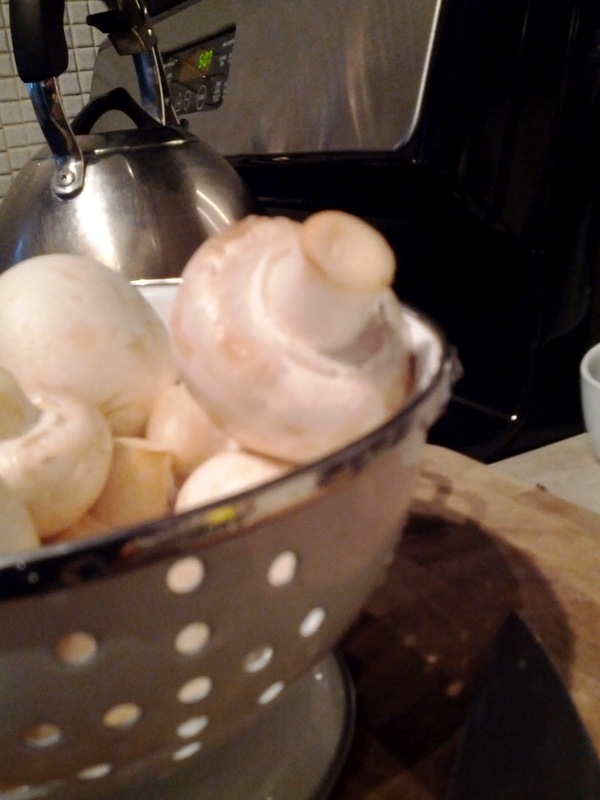 Add the mushrooms and fry gently for three minutes. Transfer the mixture to a plate and keep warm. Using the same pan you cooked the onion mixture in, heat one and a half tablespoons of sunflower oil until very hot. Add half the fillet steak and fry quickly, seasoning and turning it as you do so, for just over one minute. Transfer to a plate and repeat with the rest of the oil and steak. Return the onion mixture to the pan and pour in the soured cream. Bring to the boil and simmer for a minute or so, until thickened. Return the steak to the pan and heat very gently for one minute - the beef should not be cooked any further. 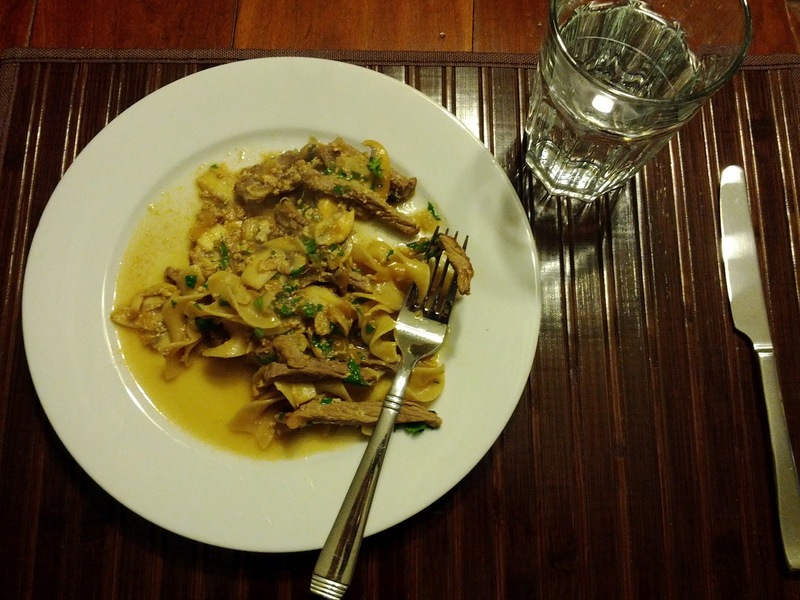 Stir in the lemon juice and parsley and serve over the prepared noodles.